« Resort Style Condominiums Featured at the New Edgewater Surrey Condos by Barber Creek – Affordable Surrey Real Estate from $190’s – VIP Sales on Now! The most prestigious Burnaby condo high-rise is setting the stage for pre-sales at the Chancellor Tower. Centrally and ideally located in the heart of the Metrotown Burnaby real estate market, The Chancellor by Polygon is the most highly anticipated condominium high-rise in the Lower Mainland with preview sales starting April 16th. The best selection of suites here at the beautiful Burnaby Chancellor Condos include two bedroom suites starting from a very affordable price point of only $379,900. Putting you right in the middle of everything, including Metropolis at Metrotown, shopping, dining, and the Bonsor Park and Recreation Centre, the new Chancellor Burnaby condos for sale are ideal for urban professional singles and couples as well as for growing families seeking spacious floor plans that are functional and beautifully designed just for you. In addition, the Metrotown Burnaby Chancellor Tower is close to great schools for all ages, BCIT and SFU for post secondary education options. The Chancellor Burnaby condo tower is located at the crossroads of Nelson Ave and Bennett Street in the heart of the Metrotown Burnaby real estate market and the 2 bedroom residences will feature floor plans between the sizes of 800 to 1100 square feet. The homes will have expansive views from oversized windows and the gourmet kitchens and sumptuous bathrooms will be detailed and finely crafted with the most high-end finishings. The pre-sale Burnaby Chancellor condos will also feature a private resident only Clubhouse with amenities such as a garden courtyard (professionally landscaped), a clubhouse lounge as well as a full gym. The prestigious Burnaby Chancellor Condo presentation centre is located at 4880 Bennett Street Burnaby and starting mid-April, they will be open from 12 to 6pm every day except for Fridays. The amazing Metrotown high-rise is brought to you by Polygon Chancellor Tower Ltd. For more details, please visit http://polyhomes.com/community/chancellor. Presenting a sophisticated New York style character, this 37 storey highrise will become one of Burnaby real estate’s tallest residential towers. Sleek architecture blends glass, granite and aluminum into an impressive statement of prestige right here at the pre-construction Burnaby Chancellor condo tower. In addition, these new Metrotown condominiums at the Chancellor Burnaby will present ultra spacious two bedroom residences that feature open plan interiors with the latest in technology and high-quality finishes. From wood cabinets to built in pantries and from sleek stainless steel kitchen appliances to caesarstone counters, the Metrotown Chancellor Burnaby condos for sale are bright, airy and awesomely spacious. The floor plans will include two bedroom layouts that are open concept with lots of flexible living spaces and the floor to ceiling window walls create a masterful view. Most of the homes here at the pre-construction Burnaby Chancellor condos in Metrotown neighbourhood will present magnificent panoramic views of the city, Deer Lake and the North Shore mountain range. Brought to you by Polygon Chancellor Burnaby condos for sale will be located next door to Bonsor Park and Recreational Centre on Bennett Street and just across from Metropolis at Metrotown shopping centre which is the province’s largest entertainment complex. To be one of the first to learn more about the presale advanced launch for the pre-construction Burnaby Chancellor condos in Metrotown, please register your interest online at www.polyhomes.com today. 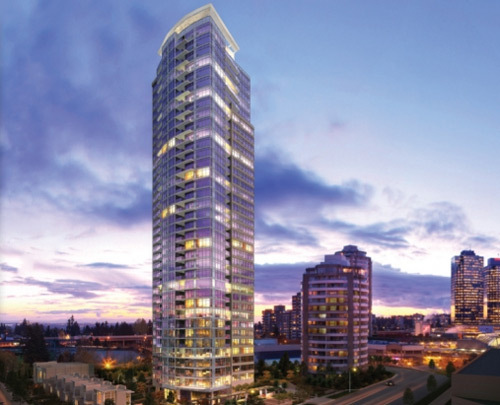 The most prestigious Burnaby condo tower is soon launching their sales program. Centrally located in Metrotown, The Chancellor Burnaby condo tower is the most exciting launch by Polygon this year and best of all, pre-sale homebuyers can get their hands on a new luxury condominium residence on Saturday, April 16th at 12 noon. Ideally situated at the cross roads at Nelson Ave and Bennett St in Metrotown Burnaby real estate market, The Chancellor Condos provides close proximity for residents to Metropolis (huge shopping and entertainment district) as well as many green spaces such as Bonsor Park and the Recreational Complex which you can get to in a mere minutes. As there is minimal information and details published about these new Metrotown Burnaby Chancellor condos, the advanced info does include the floor plan sizes of the draft layouts. As expected, the Chancellor floor plans will range from eight hundred square feet (800 sf) to eleven hundred square footage (1,100 sf). In addition, most if not all of the homes will be two bedroom layouts, providing ample living space both outside and in. As one of the tallest high-rises in the Metrotown Burnaby real estate market, The Chancellor Condo tower will rise 37 floors and provide stunning panoramas of the North Shore mountains, Deer Lake as well as the surrounding cityscape. The expansive floor to ceiling windows will provide the best views in town from your private living room. Some of the interior features that are expected include designer high-end finishings everywhere in addition to resort style bathrooms as well as gourmet chef inspired kitchens. In addition to the exciting news about the floorplans and interiors, The Chancellor Burnaby condos for sale will introduce onsite private in building amenity centre that will include such conveniences as a clubhouse lounge with comfortable seating area, a fully equipped gym as well as a professional landscaped courtyard garden. Hundreds of prospective Metrotown Burnaby homebuyers have already pre-registered, so now is the time to take advantage of the private VIP tours and pre-sales marketing information by calling 604.433.6939.